Not to be confused with Open Software Foundation or National Open Source Enterprise. The Open Source Initiative (OSI) is an organization dedicated to promoting open-source software. The organization was founded in late February 1998 by Bruce Perens and Eric S. Raymond, part of a group inspired by the Netscape Communications Corporation publishing the source code for its flagship Netscape Communicator product. Later, in August 1998, the organization added a board of directors. Raymond was president from its founding until February 2005, followed briefly by Russ Nelson and then Michael Tiemann. In May 2012, the new board elected Simon Phipps as president and in May 2015 Allison Randal was elected as president when Phipps stepped down in preparation for the 2016 end of his Board term. 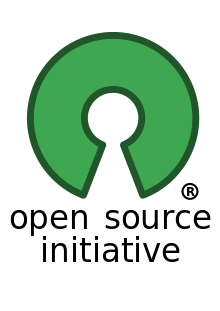 As a campaign of sorts, "open source" was launched in 1998 by Jon "maddog" Hall, Larry Augustin, Eric S. Raymond, Bruce Perens, and others. The group adopted the Open Source Definition for open-source software, based on the Debian Free Software Guidelines. They also established the Open Source Initiative (OSI) as a steward organization for the movement. However, they were unsuccessful in their attempt to secure a trademark for 'open source' to control the use of the term. In 2008, in an apparent effort to reform governance of the organization, the OSI Board invited 50 individuals to join a "Charter Members" group; by 26 July 2008, 42 of the original invitees had accepted the invitations. The full membership of the Charter Members has never been publicly revealed, and the Charter Members group communicated by way of a closed-subscription mailing list, "osi-discuss", with non-public archives. Public information indicates that the group included Bradley M. Kuhn, Karl Fogel, Jim Blandy, Chamindra da Silva, Lawrence Rosen, and David Ascher. Then-OSI Board member Danese Cooper was the principal moderator of osi-discuss. Kuhn later recollected that the Charter Membership was a "brouhaha (bordering on a flame fest)" and took no action. In 2009, the OSI was temporarily suspended from operation as a California corporation, apparently in response to a complaint concerning tax paperwork from earlier years. Its current status is "Active". In 2012, under the leadership of OSI director and then-president Simon Phipps, the OSI began transitioning towards a membership-based governance structure. The OSI initiated an Affiliate Membership program for "government-recognized non-profit charitable and not-for-profit industry associations and academic institutions anywhere in the world". Subsequently, the OSI announced an Individual Membership program and listed a number of Corporate Sponsors. On November 8, 2013, OSI appointed Patrick Masson as its General Manager. Both the modern free software movement (launched by Richard Stallman in the early 1980s) and the Open Source Initiative were born from a common history of Unix, Internet free software, and the hacker culture, but their basic goals and philosophy differ. The Open Source Initiative chose the term "open source," in founding member Michael Tiemann's words, to "dump the moralizing and confrontational attitude that had been associated with 'free software'" and instead promote open source ideas on "pragmatic, business-case grounds." As early as 1999, OSI co-founder Perens objected to the "schism" that was developing between supporters of Stallman's Free Software Foundation (FSF) and the OSI because of their disparate approaches. (Perens had hoped the OSI would merely serve as an "introduction" to FSF principles for "non-hackers.") Stallman has sharply criticized the OSI for its pragmatic focus and for ignoring what he considers the central "ethical imperative" and emphasis on "freedom" underlying free software as he defines it. Nevertheless, Stallman has described his free software movement and the Open Source Initiative as separate camps within the same broad free-software community and acknowledged that despite philosophical differences, proponents of open source and free software "often work together on practical projects." ↑ "OSI Board Elects New Officers". 2012-05-21. Retrieved 2012-05-23. ↑ Phipps, Simon. "Outgoing President tweet". Retrieved 13 May 2015. ↑ Phipps, Simon. "Handing On The Baton". Open Source Initiative. Retrieved 15 May 2015. ↑ "OSI Board Meeting Minutes, Wednesday, October 1, 2008 | Open Source Initiative". Opensource.org. Retrieved 2012-08-13. ↑ Bradley M. Kuhn Bradley M. Kuhn , Richard Fontana (2011-06-07). "Bradley M. Kuhn (bkuhn)'s status on Saturday, 16-Jun-12 15:45:57 UTC". Identi.ca. Retrieved 2012-08-13. ↑ Categories: Licensing,Software. "451 CAOS Theory » The Open Source Initiative's corporate status is suspended: a CAOS Theory Q&A". Blogs.the451group.com. Retrieved 2012-04-21. ↑ "Use Search Type=Corporation Name and search for "Open Source Initiative"". Retrieved 2010-02-24. ↑ "Become an OSI Affiliate". ↑ "OSI Announces Individual Membership". ↑ "OSI Names New General Manager". LWN. 2013-10-23. Retrieved 2014-01-27. ↑ Tiemann, Michael (2006-09-19). "History of the OSI". Open Source Initiative. Retrieved 2009-04-25. ↑ "It's Time to Talk About Free Software Again". 2014-11-19. Retrieved 2014-11-19. 1 2 Stallman, Richard (2009-04-21). "Why 'Open Source' Misses the Point of Free Software". Free Software Foundation. Retrieved 2009-04-25. ↑ "Welcome New OSI Board Directors: 2016 Election Results". Open Source Initiative. Retrieved 28 May 2016.